The sequal to "The Girls of Nowolipki" is set in Warsaw after the First World War, when Poland regained her independence. Again, the film follows the lives of three young heroines. Druga czesc "Dziewczat z Nowolipek", dalsze losy mlodych bohaterek po I wojnie swiatowej, wkrotce po odzyskaniu przez Polske niepodleglosci. Directed by Barbara Sass. 1985, Color, 112 mins. In Polish with English Subtitles. 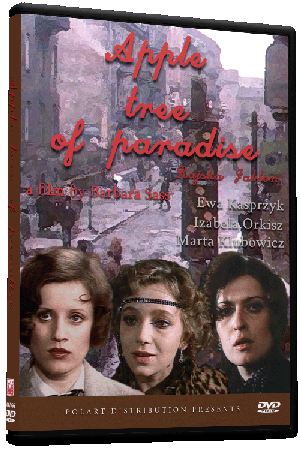 Apple Tree of Paradise (Rajska Jablon) takes place about eight years after Girls from Nowolipki, shortly after World War I. The title of the movie can be considered a metaphor of the events in the story. When the women take what is forbidden they are punished for their actions. Although it is not much of a surprise that forbidden fruit leads to trouble, this classic theme is sure to deliver drama. As you know from part one, these girls love their apples. Amelka is married but cheats on her husband looking for amusement and love. Bronka is single but finds her delights in married men. The adulterers want love but look for it in the wrong places. The final woman in the trio is different than her friends. Kwiryna doesn't quite fit the metaphor of taking the forbidden and her only sin is being on the cheap side. Kwiryna doesn't cheat on the husband she loves but has troubles because she is frugal. Her husband is on the lazy side and very generous with her money, which causes them argument after argument. She sacrifices her own pleasures to save money while her husband believes he is generous giving away the money she earned. I would say Apple Tree of Paradise is as good or better than Girls from Nowolipki. I like this movie because it has a well-orchestrated story with a sense of balance and symmetry. The choices the women make are echoes of the choices they made in their youth. Furthermore, the choices they make make their lives spiral out of control. One can rationalize how they got this way and say they were in difficult situations or had bad judgments (or a combination of the two) but, as with tragedies, maybe it was just meant to be.